Quite a fair bit has happened this week! I took a flight from Ho Chi Minh City to Danang. Despite hearing that Vietjet flight, one of the discount airlines offering flights around Vietnam, is often delayed, I was lucky – we boarded right on time! It was just a short hour or so flight to Danang – much quicker than the 15 hour+ train ride I was considering earlier. In Danang, I spent the night at the Continent Hotel. 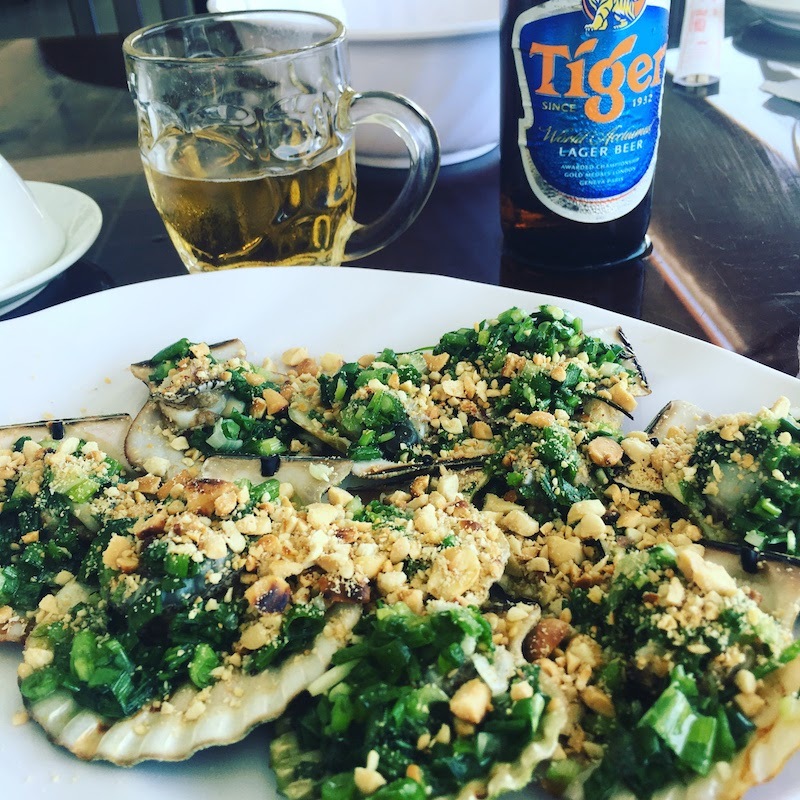 While considered a budget hotel by Vietnam pricing standards (around $15 – $20), it was very nice and would be way out of my price range at home. The room had no window – a deal some of this hotels have which cheaper priced rooms, but it didn’t bother me at all. The room was very nice and modern – it felt very fancy. Plus, the bed was very soft (which seems uncommon for most Vietnam hotels). 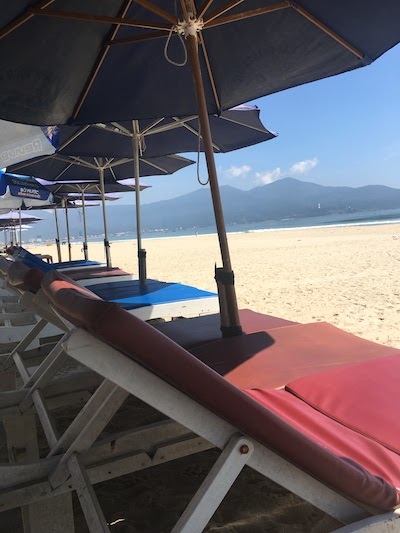 The staff was very friendly and helpful, chatting with me about my trip and offering suggestions for what to do in the area and how to get to Hoi An. What was really cool about this hotel is that it was INSANELY close to the beach – like less than 5 minutes by bike. The hotel had free motorbikes and pedal bikes to borrow. I wimped out and got a pedal bike. The street down to the beach is very quiet and residential, making it a very safe and easy bike ride, even in the craziness that is Vietnam city streets. I biked along the nearly empty beach, snapping photos and taking a break to enjoy a nice meal of scallops and of course my beloved Vietnamese iced coffee. Then for a small fee (100 dong) I rented a chair, umbrella, and ordered a coconut water drink and relaxed by the beach for a bit. The water was sooo warm – much better than our terrible icy New England waters. In Danang there is also a really cool dragon bridge – it’s really quite remarkable. That evening I was lucky – on Saturdays and Sundays the bridge does a show of sorts where it spits our fire and water into the sky. 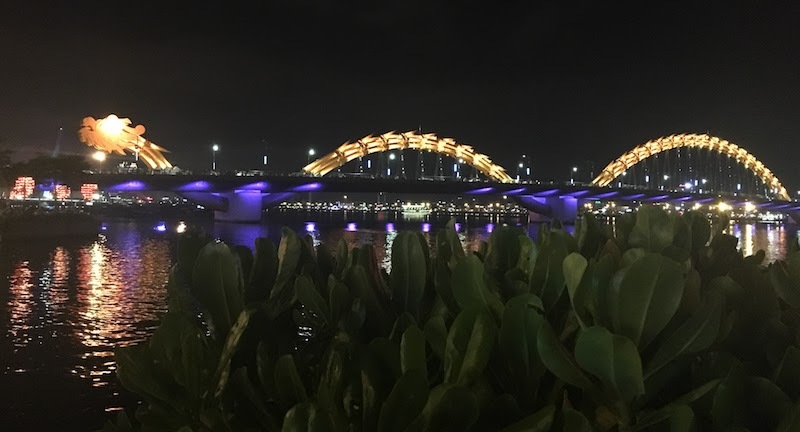 I had dinner at the fantastic (although high end by Vietnam standards) Fatfish restaurant along the water, and was then let up onto the roof where I had the perfect view of the dragon bridge show! One of the waiters – Tai – was really sweet. He chatted away with me telling me about the city of Danag, its history, and asking about my trip. He was happy to practice his English and I was thrilled to have some good company. From Danang I took an Uber to Hoi An. It’s a 45 minute car ride, and normally I’d never dream of ordering an Uber for such a trip, but here in Vietnam Ubers are dirt cheap. I think it ended up costing me $10. From the car I had a great view of the country. It was neat to drive through tiny dirt villages that really give you a sense of how poor some parts of Vietnam are.